Hello! I’ve been a Licensed Esthetician since 1997. I started my career in Esthetics at the top day spa in the U.S., I then started a skincare practice in a busy San Francisco Cosmetic Surgeons office, then I opened a busy San Francisco skincare clinic, and now I’m located in the South Bay Area. Very soon after I became an Esthetician, I noticed an undeniable link between nutrition and skin, so I went to school to become a Certified Holistic Nutritionist. I love being able to give my clients tips and ideas to achieve their skin goals from a holistic and integrated perspective. My focus is on healthy skin from the inside out and this naturally promotes healthy aging. I strongly believe in continuing my education with lifelong learning in my field. I’ve studied many skin concerns and healing modalities. I draw upon my training, i.e.. “my skincare toolbox” when I work with my clients. My passion is helping my clients feel amazing about their skin. When needed and desired, I also employ clinical tools as well, such as Lightwave LED, Ultrasonic treatments, Microcurrent, Oxygen infusion therapy, Microdermabrasion, many different type of peels and much more. I attend conferences, classes and seminars, around the world- always seeking out the latest and most effective treatments, but also have many special, tried and true treatments, that I’ve used on my clients for the last 20 years. 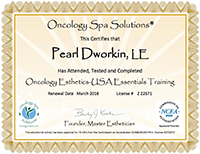 I’m certified in Manual Lymphatic Drainage, Oncology Esthetics, Advanced Facial Massage techniques, Aromatherapy, Gua Sha, Facelift Acupressure, Craniosacral, Gua Sha, Foot Reflexology and many other modalities. I’ve also attended multiple advanced trainings in skin conditions, such as acne, rosacea, sensitivity, premature aging, hyper pigmentation, etc. I’m a certified skin geek and my mission is giving my clients not only an effective and relaxing treatment, but an experience that also leaves them glowing and feeling renewed on every level. 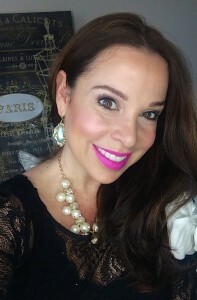 I look forward to meeting you and helping you achieve your most radiant skin!